Wonder about traffic detours and noise around N-NE 80th Street between Aurora and I-5? It’s a PSE Natural Gas Main Replacement Project. 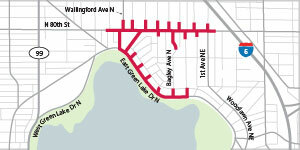 In an ongoing effort to deliver safe and reliable energy to our Green Lake-area customers, Puget Sound Energy (PSE) is upgrading the natural gas system in your neighborhood. The work requires PSE to replace the existing natural gas main, installed in 1979, with new, corrosion-resistant plastic pipe. We’ll also be replacing individual service lines to some homes and businesses. We’ve been working proactively with the Seattle Department of Transportation (SDOT) in planning the timing of construction to commence shortly ahead of SDOT’s Green Lake and Wallingford Paving and Multi-Modal Improvements project. – We’ll provide more detail on construction timing once we have the street use permit in-hand. – Work hours: Monday through Friday, 8 a.m. – 4 p.m.
– Some weekend work may be required. Where: Portions of NE 80th St, Wallingford Ave N, Burke Ave N, Stroud Ave N, Meridian Ave N, Bagley Ave N, Corliss Ave N, Sunnyside Ave N, 1st Ave NE, E Green Lake Dr N, N 78th St, N 77th St and Orin Ct N (Refer to map on reverse). To prepare for this work, crews will be surveying the project area and marking current underground utilities with brightly colored paint or flags. These markings are temporary and will disappear on their own. Signs and traffic control flaggers will guide vehicles and pedestrians safely through the work zone. Crews will maintain access to driveways whenever possible, in coordination with impacted neighbors. Curbside parking will be impacted as the crews move along the project route. “No parking” signs will be placed in the work area prior to parking restrictions, and we’ll do our best to minimize the time and area impacted. Typical construction noise from trucks and heavy machinery. As part of this work, some customers will have the gas service line to their home or business replaced, requiring a short interruption of natural gas service. We’ll provide affected customers with more information in advance of the service line work occurring on their property. You’ll notice temporary patches in the road and/or sidewalk after crews have completed installation of the new pipe. These temporary patches will remain until a contractor crew returns to complete the final road and/or sidewalk restoration. The restoration schedule is dependent upon weather, permitting and crew availability. We’re proud to serve in your community and aim to complete the work with minimal disruption. If you have questions about the project, please contact me and reference project #109107231. Thanks for your patience while we complete this important project.